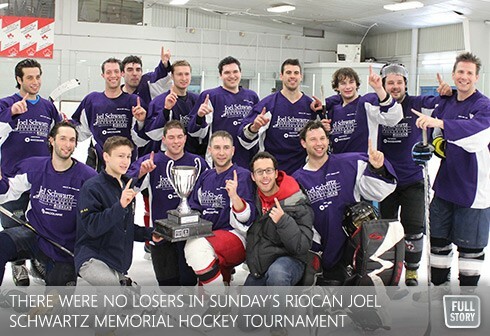 By Jessica Taylor -- The third annual RioCan Joel Schwartz Memorial Hockey Tournament (JSMHT) wrapped up at Toronto’s Chesswood Arena on Sunday, March 10, 2013, and, as usual, the tourney – a joint initiative of UJA’s Community Connect and Reena Foundation – did not disappoint. The round robin tournament brought out some 300 players, including 16 competitive men’s teams and 4 teams of “boomers” age 45+ years. Over 400 fans attended the tournament finals, which saw Maple Leafs’ sniper Phil Kessel drop the ceremonial puck. Most importantly, this young adult initiative continued to generate awareness about autism and, in 2013 alone, has raised over $200,000.00 for programs benefiting the developmentally disabled community. The JSMHT is held in honour of Joel Schwartz, who tragically passed away on March 3, 2009 at age 25 years. Joel, who was born with autism, had a profound experience on a Taglit-Birthright Israel: CIE trip accompanied by a shadow just two months before he passed away. Motivated by Joel’s unique experiences, funds raised through the JSMHT support multiple programs in perpetuity that benefit Toronto’s developmentally disabled community. One such program is CIE’s Taglit-Birthright Israel Shadow program which provides the opportunity for young adults with disabilities to travel to Israel alongside their non-disabled peers. New this year, UJA’s Community Connect is working with the JSMHT team to “Live the Cause” and create opportunities for young adults to get involved with direct programming for people with developmental disabilities. JSMHT players, committee members and community volunteers have worked together to run a hockey skills workshop for Reena clients and have enjoyed an outing to a Marlies game. JSMHT founders and close friends of the Schwartz family, Zack Belzberg and Jesse Abrams (both age 25 years), have been instrumental in mobilizing their team to raise a combined total of $450,000 over the last three years. “The hockey tournament provides a way for young people to contribute to the community, and really make a difference,” says Belzberg. “We truly believe that Joel would love the work and programming that the JSMHT network is providing for young adults with developmental disabilities” adds Abrams. To find out more about the JSMHT, please visit www.jsmht.org or contact Jessica Taylor, jtaylor@ujafed.org.